|msg=You do not need to do anything on this page if all you are doing is watching recorded shows using Myth TV, then deleting them or letting them auto-expire. You will not save very much space. 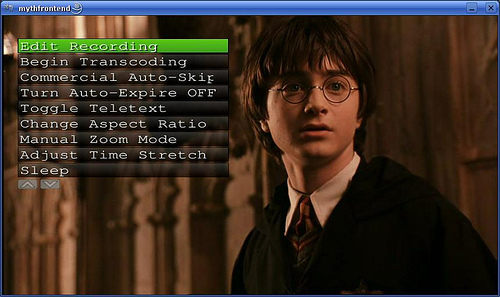 What the instructions on this page are useful for is if you're storing or archiving your recordings, or are watching your recordings outside of MythTV, or want to watch "HDTV" programming on a slower machine in standard definition. 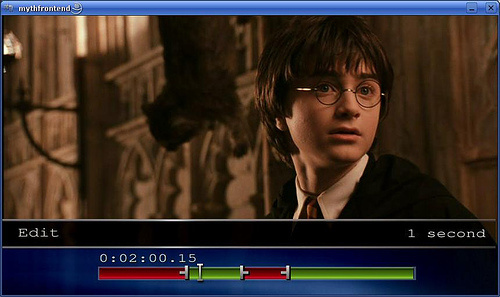 To Edit a Recording press [[Image:remoteMenu.png]] to bring up the On Screen Menu. Select Edit Recording. Hit Z to load the current commercial cutlist, if the commercial flagging job had already been run. To invert the cutlist -- e.g., to keep the commercials and remove the program -- hit 'I'. 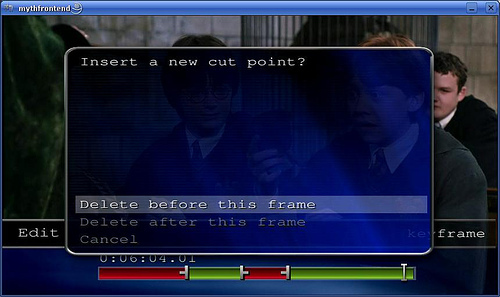 Use [[Image:remoteSelect.png]] to choose between Delete before this point or after this point. Just add the cutpoints that you need. The system will remember these the next time that you bring the recording up. Red areas along the Timeline will be deleted (Skipped). Green areas will be played. What I noticed is that (even from the command line) mythtranscode fails to 'honor the cutlist' when used with the "-i <filename>" syntax, but when that is switched to "-c <channel> -s <datetimestamp>" everything suddenly works fine. Don't know why, but it helped me to make things work.